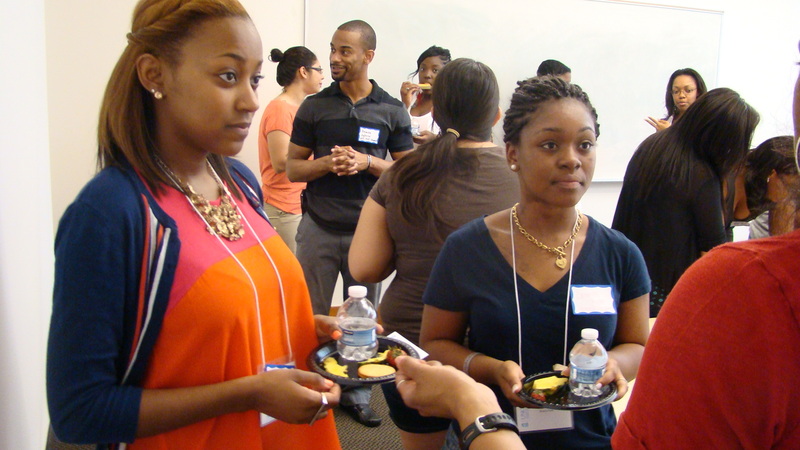 Students mingle at the Partnership Program Networking Event. The Gillings School of Global Public Health is committed to the diversity of our students, faculty and staff and the reduction of health disparities in the world around us. In the spirit of this commitment, faculty, staff and students throughout the School seek to foster an environment that attracts a diverse group of top-notch students and helps them to thrive. For more information about how we cultivate a diverse and inclusive environment to better prepare our students for the diverse world that awaits them, visit the Diversity and Inclusion pages. On behalf of the Gillings School, our staff engages in activities and services to attract qualified students with diverse backgrounds, including under-represented minority and international students. K-12 and higher education counselors, advisers and faculty. Interested in organizing a visit to the Gillings School? Would you like to have a School representative attend your event or program? We are here to help. Please contact us at sph-osa@unc.edu or check out the Visit Us page. Interested in finding information on in-state, regional schools, and national recruiting conferences our School attends? Contact Trinnette Cooper, Coordinator of Diversity Programs and Recruitment at coopert@email.unc.edu. Community service related to the research. Selection process. The selection process for Project IMHOTEP is very rigorous and extremely competitive. Only serious, self-motivated and disciplined students should apply. Candidates should have a demonstrable interest in pursuing a public health career, with a particular emphasis in biostatistics, epidemiology, or occupational safety and health. Eligibility: College juniors, seniors and recent graduates. Website: Visit http://www.morehouse.edu/phsi/imhotep.html for more information. Questions? Contact Trinnette Cooper at coopert@email.unc.edu or (919) 966-5294. Partners Program: Summer research opportunities for NCCU and UNC-Chapel Hill undergrads The Partners Program aims to increase the number of undergraduates from North Carolina Central University (NCCU) and UNC-Chapel Hill who successfully pursue careers devoted to finding causes, cures, and prevention strategies for cancer that disproportionately affect minorities, particularly African Americans. To do this, leaders from NCCU and the UNC-Chapel Hill Lineberger Comprehensive Cancer Center (LCCC) are working together to lay the groundwork for an inter-institutional training program for undergraduates who are motivated to pursue careers in basic cancer research and in public health. The SPH Office of Student Affairs coordinates summer research opportunities with LCCC and NCCU students. The conference is co-sponsored by various organizations in and outside the University. National Health Equity Research Webcast Each summer, the UNC Gillings School of Global Public Health, Office Of Diversity and Multicultural Affairs, Frank Porter Graham Child Development Institute and partners collaborate to highlight an emerging issue within health disparities through a live-streamed symposium. For more information, visit https://sph.unc.edu/mhp/nat-health-equity-research-webcast/. Summer Public Health Symposium We appreciate your interest, however, the Summer Public Health High School Symposium program has ended. Contact: Trinnette Cooper at coopert@email.unc.edu or (919) 966-5294.